I’m not a big believer in the significance of home/road splits. Prince Fielder hit .326 at home during the regular season but only .272 away. Nyjer Morgan had the opposite problem; he hits.279 at Miller Park, but .328 on the road. Corey Hart batted .316 at home and .252 away. Ballparks can affect hitters and pitchers; large ballparks, for example, might favor pitchers, while smaller parks like Great American in Cincinnati are a hitter’s delight. But those stats should balance out over the course of a season at teams travel to different parks. And those splits can probably be explained by other things, like, say, the opposing pitcher, or (in Hart’s case, for example) where he hit in the batting order. 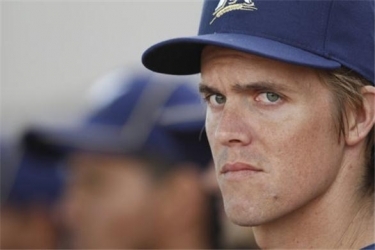 But I don’t know how to explain what Zack Greinke has done at Miller Park this year. A 3.13 home ERA versus a 4.70 road ERA is a head scratcher, especially since the Keg isn’t exactly known as a pitcher’s park. The same is true for Greinke’s 1.29 road WHIP versus 1.13 at home. All that led Greinke to a 5-6 road record, but a perfect 11-0 at home during the regular season. There’s some aspect of luck in this, we know that. Wins and losses are a pretty arbitrary way to measure a pitcher’s value, especially in the Moneyball age. A player’s record is only as good as his run support, and Greinke’s had a lot of it. The Brewers scored 6 or more runs in 16 of Greinke’s 28 starts; 3 or more in 21. Greinke continued his perfect trend at home in the postseason with a little help from his friends. In Game 2 of the NLDS, Greinke was throwing BP to the Arizona Diamondbacks, allowing four runs on three dingers and lasting only five innings. The offense bailed him out, though, with a five-run sixth, and Greinke maintained his perfect home record. An eerily similar scene unfolded today at the Keg. Greinke was not sharp in Game 1 of the NLCS, tossing 107 pitches in 6 innings, only 67 for strikes. He walked two and came damn close to walking about six more; I don’t know how many 3-2 counts he was in today. And his six earned runs – three of them off a David Freese round-tripper – would place this start firmly among Greinke’s worst of the season. And yet on a day the Brewers should have been soundly defeated, the offense again bailed Greinke out to maintain his perfect home record. This entry was posted in News and tagged 2011 Postseason, Brewers, Cardinals, Zack Greinke. Bookmark the permalink.